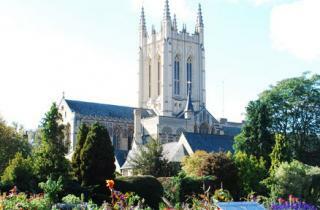 St Edmundsbury Cathedral, Bury St Edmunds, is encouraging users of its toilet facilities to give generously as money raised will support the provision of toilet facilities in Pakistan. Through the charity Toilet Twinning (part of Tearfund), the Cathedral has twinned the Cathedral toilets with a school toilet block in Sindhri, Sindh Province, Pakistan. This charity has been working since 2008 to raise awareness of poor sanitation. For example, 2.5 billion people have nowhere safe, clean and hygienic to go to the toilet and every day, 1,800 children under the age of five die due to unclean water and poor sanitation. The charity’s work has encouraged communities to work together to build the facilities and has helped reduce drop-out rates for teenage girls at school. Hygiene training helps to reduce sickness which in turn gives renewed zest for life and work – improving harvests and finances. All donations will be split 50:50 between toilettwinning.org and maintenance of the Cathedral toilet facilities.